It’s no small coincidence that Fed bond buying was responsible for the big move in 2008 (and 2011 for that matter). I’ve not been shy about pointing out that last week’s Fed decision was functionally equivalent to announcing another bond buying program. Such programs are rising tides that lift all boats. 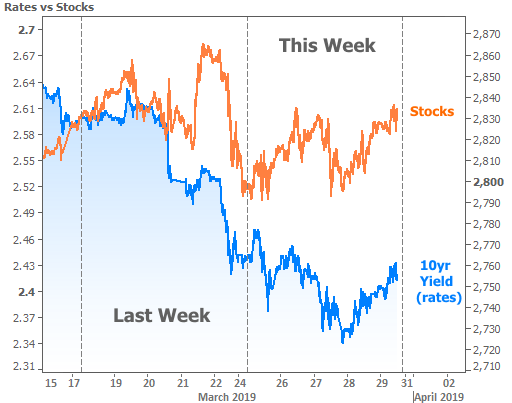 Case in point: stocks and rates improved simultaneously (seen as the orange and blue lines moving apart on the following chart) when the Fed first hinted at the change on January 30th. Last week brought more of the same although the benefits were mostly reserved for rates. 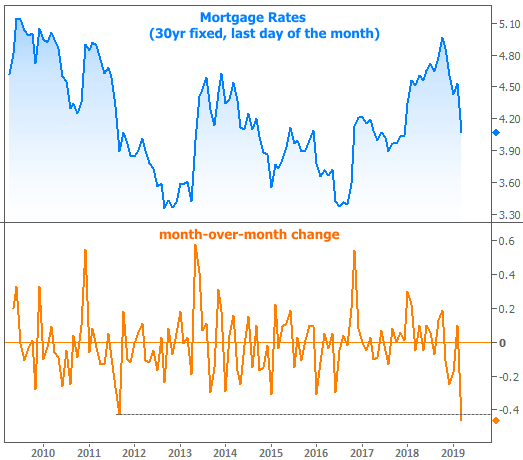 But that was last week’s news, and indeed, most of the bond market movement responsible for the drop in rates occurred last week. 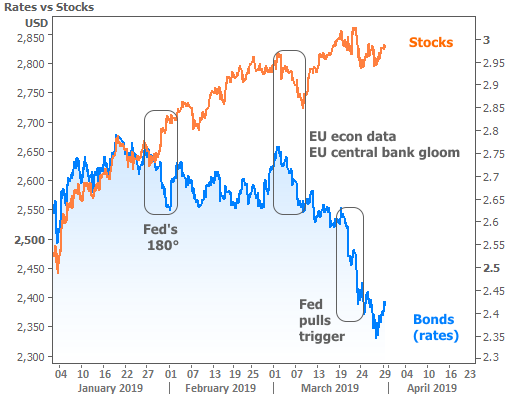 Since then, things have evened out a bit for both stocks and bonds. 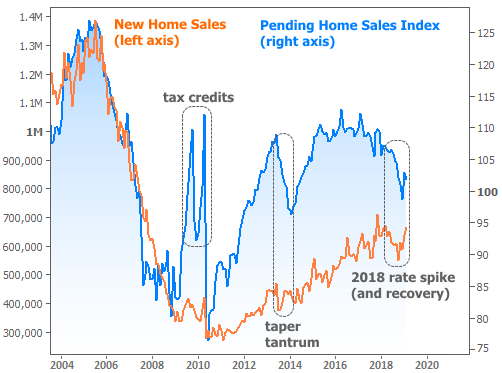 As markets wait to see what upcoming economic reports suggest, there are several important ceilings and inflection points we can watch in rates. It’s easier to do this with 10yr Treasury yields, even if our main concern is mortgage rates. In 10yr terms, rates have convincingly broken below 2.55% and 2.47%. They’re now fighting to break under 2.40%. Why should we care if 10yr yields can stay near or under 2.40%? 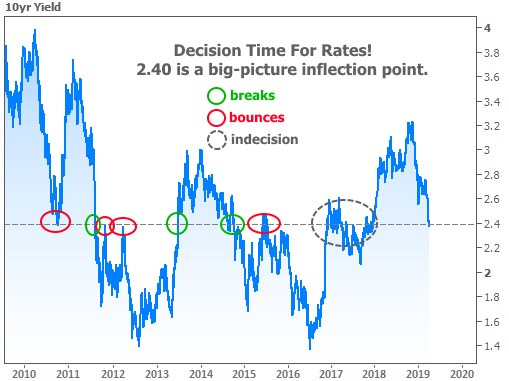 It could turn out to be nothing this time around, but past precedent suggests 2.40% as an important inflection point (meaning rates have almost always bounced there, or moved through forcefully). The only time they came close to lingering was in 2017, but even then, there was more of the same “inflection point behavior” on a smaller scale. 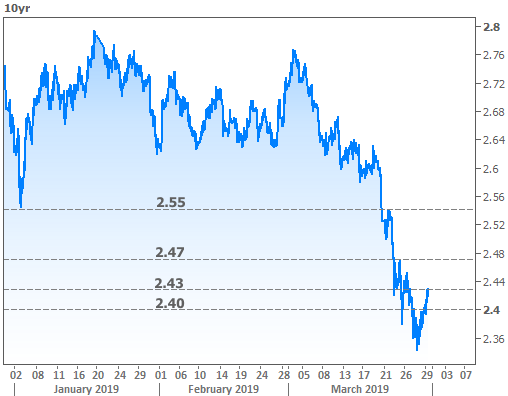 More simply put, assuming the precedent holds, if rates can break below 2.40%, they should keep moving lower (as they did in 2011 and 2014). If they bounce, it’s not the end of the world. A bounce could actually make the subsequent move more sustainable as long as they stay under 2.55%. 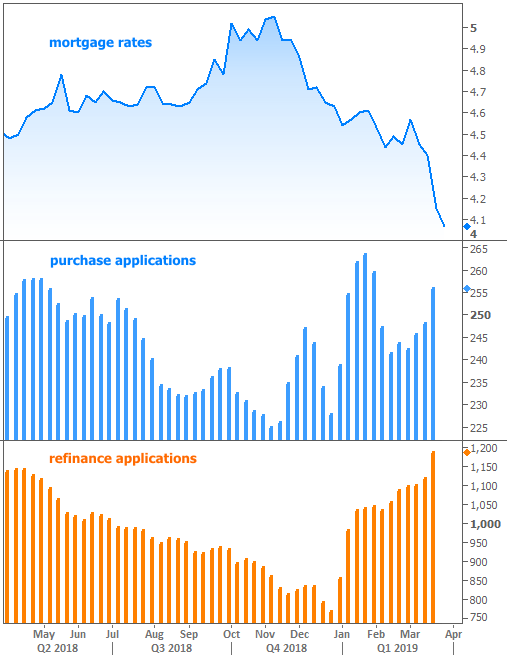 Elsewhere in the housing data sphere, home price reports, which run a month behind the sales reports, are giving mixed signals. 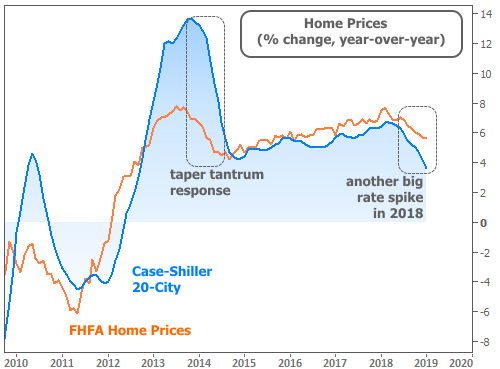 Case-Shiller data indicates slower price growth in January while FHFA’s price index increased 0.6% compared to December’s 0.3% gain. This isn’t necessarily troubling because prices tend to be slower to respond to changes in interest rates. In any event, both indices continue to operate safely in positive territory. Last and least (at least among these peers), New Residential Construction contracted a bit in February. 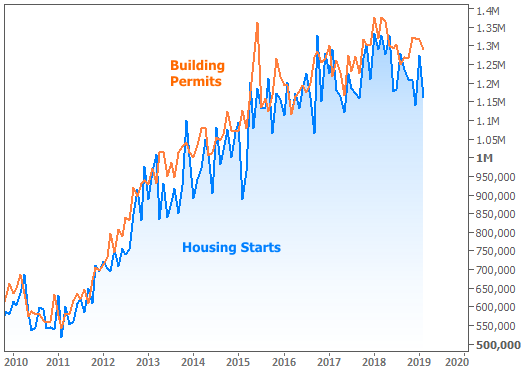 The move was more pronounced in terms of housing starts (the first phase of construction), which are typically more volatile compared to the mere filing of building permits. This data series isn’t of tremendous interest because it’s been much steadier than the sales-related reports. If financial markets are going to make big decisions based on economic data, next week could be interesting. 4 out of 5 days have significant reports with Retail Sales and ISM Manufacturing leading things off on Monday. ADP Employment and ISM Manufacturing make Wednesday a candidate for volatility as well, but Friday trumps all with the mighty jobs report. The payroll count (part of the jobs report) will be especially interesting following last month’s shockingly low 20k. The current consensus is for 170k.